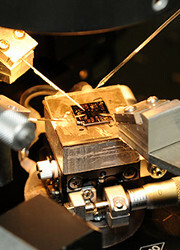 The axis involves thirteen scientists and support staff as well as about twenty PhD students and Postdoctoral fellows, bringing together a variety of complementary competences related to the design and production of devices with specific surface properties for analytical chemistry, including in particular various types of micro/nano (bio) sensors, integrated or not into analytical microsystems. The axis focuses on surface analysis, micro/nanostructuration of surfaces, control of surface chemistry, reactivity of bio-interfaces, electrochemistry. This multi-competence axis is composed of project-driven groups. Devices exhibiting specific surface properties are developed for many materials applications (metals, polymers,…) and micro/nano (bio)sensors (for the most part electrochemical ones) are developed for environmental, health and food applications (fast, cost effective and multiplexed analytical methods suitable for the monitoring of environmental and food contamination, toxicological impact assessment, medical diagnosis and therapeutic applications). In the latter context, (bio)sensors appear very exciting alternatives or complementary techniques to conventional chemical methods. For (bio)functionalized microdevices, either in-situ analyses, point-of-care diagnostics and/or personalized medicine are targeted. Other devices exhibiting specific surface properties include metals and nanoparticle patterns for applications not only in sensors and lab on chips but also in plasmonics, chemistry, catalysis, and solar energy. More specifically, target applications are either cost effective compared to conventional lithography or surfaces that cannot be obtained using conventional lithography e.g. patterning on non planar substrates and applications on polymers, ceramic or carbon.